DETROIT – Marc-Andre Fleury had his pads off and was sitting calmly in his little spot to the left of the entrance into the visitor's dressing room by the time the media horde invaded the Pittsburgh Penguins' headquarters inside Joe Louis Arena. As soon as the cameras, microphones and tape recorders were shoved in his face, Fleury leaned back against the wall. He let out a big sigh of relief and then did his chores as Pittsburgh's MVP of Game 5. Sure it was Petr Sykora who scored the third overtime winner 109:57 after the game's opening faceoff, but what Fleury accomplished before that easily made Monday night's performance the greatest of his young career and a tough one to top. "It's the longest game I've played and the most tiring one," Fleury said, "but also the most satisfying one." Fleury stopped 55 of the Red Wings' 58 shots on goal, including all 24 he faced during the 49 minutes and 57 seconds of overtime action. "I take a peak (at the scoreboard showing shots on goal) once in a while, but I really just try to make my next save," Fleury said. "One shot at a time and wait for us to get a big goal, which we did." With the Red Wings buzzing on his side of the ice most of the night, the only time Fleury had to take a breath was during television timeouts, of which there were none in overtime. But he did skate off the ice with 1:27 left in regulation to watch from the bench as Maxime Talbot, his replacement, remarkably tied the game 52 seconds later. "It was a high-tempo game, lots of action," Fleury said. "I was very comfortable." Fleury, though, looked devastated after he surrendered the Red Wings' third goal 9:23 into the third period, which completed Detroit's comeback from an early 2-0 hole. But he fought through that and made another four saves before Talbot's tying goal. In overtime, he was simply brilliant as he made magical saves left and right. When he left rebounds, he stopped the second shot, too. "He was outstanding tonight. He was outstanding in overtime," Penguins coach Michel Therrien said. "No doubt it's the most important win in his career." Fleury didn't flinch when Tomas Holmstrom, standing in the high slot, had the Stanley Cup on his backhand and no one standing in his way 6:38 into the first overtime. He looked calm making a remarkable save on Kirk Maltby about three-and-a-half minutes later. He got his glove out just far enough to deflect Niklas Kronwall's potential Cup winner at 13:06. Fleury provided more of the same dramatics in the second overtime. He started with a good save on Maltby at 2:47. He had a huge save on Dan Cleary less than a minute later. Cleary was called for goalie interference on the play. Fleury made a right pad save on Darren Helm. He stopped an initial attempt by Jiri Hudler about 10 minutes into the second OT session, and then gobbled up the rebound attempt by Cleary. The Red Wings had 20 shots in the first 40 minutes of overtime. "He finished with 55 saves and some of those ones in overtime were outstanding," Penguins defenseman Ryan Whitney said. "Just think, if they scored they win the Cup." But Fleury's most impressive save of the night came 17:12 into the second period when the Penguins were clinging to a 2-1 lead. Mikael Samuelsson and Valtteri Filppula came in on a 2-on-1 break. Samuelsson passed it to Filppula rushing down the left side, but to Fleury's surprise, the young Finn sent the puck back across to Samuelsson. Fleury quickly dashed across the crease and split out just far enough to get his left toe on Samuelsson's shot. Seconds later Penguins defenseman Sergei Gonchar went flying into the end boards and wound up with back spasms that kept him out until the third overtime. "(Samuelsson) passed it across and I thought (Filppula) was going to shoot, but he passed it back," Fleury said. "I tried to get over there and it got my toe. I was pretty happy with that save." The Pittsburgh defensemen were ecstatic with that save, and each and every one that came after it because as soon as Gonchar went out they needed Fleury to play bigger than he ever had before in his career. "I think he has kind of topped himself in these playoffs," Penguins defenseman Rob Scuderi said. "We needed him to be big because they played on our side of the red line most of the night. He came through for us every single time." Scuderi said Fleury's ability to control rebounds was most important. Get your Marc-Andre Fleury jersey now! "Detroit shoots a lot of pucks from out far. They may not be dangerous, but if he doesn't handle the rebound they become dangerous," Scuderi said. "He did an awesome job all night of controlling his rebounds or putting them into an area that wasn't so dangerous. That's a huge deal for us as defensemen because you don't have to waste energy and time trying to box out a guy." Penguins goalie coach Gilles Meloche said that's part of the basics he works on with Fleury and backups Ty Conklin and Dany Sabourin on a daily basis. Meloche was thrilled to see the work pay off in such a huge game. "After losing a tough game the other night and to come back with that performance, you can't ask for anything better," Meloche said. "All the credit goes to him." "He was the MVP of the game," Scuderi added. "I mean, how many times did he save us?" 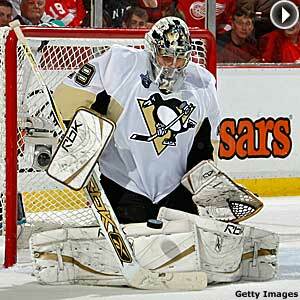 "I just tried to do my job," Fleury said, "just tried keep the puck out of the net until we got a big goal."